Home » Preventing Office Fires…It’s Your Job! 1. Keep all wiring and electrical equipment up to date and well maintained. Electrical fires are the most common kind. Turn off all equipment at the end of the day. 2. Leave space around heat producing equipment such as copy machines and coffeemakers. Be especially careful not to store flammable material in these areas. If you have any of the older style CRT monitors or televisions, do not stack books or papers on top of them. Also do not stack books blocking heat vents from computers, printers, etc. 3. Use smoke and fire detectors as well as manual alarms. Make sure employees know the location of manual alarms. 4. Have regular fire drills and make sure employees know the safest way out. They should count doors or desks between their work areas and the nearest exit. Post evacuation plans and make sure you have a good plan to evacuate disabled employees. Do not block fire exits or stairwells. Instruct employees to close office doors behind them when they evacuate, as this can control the spread of fire. Post proper signage to mark all fire exits. 5. Install a sprinkler system. Yes, they can cause water damage, but fire damage is worse. Sprinkler systems can be automatic or manual – consider which is the best option for your facility. Automatic systems are often more reliable, but also more prone to going off unintentionally and causing damage. 6. Make sure you have manual fire extinguishers in the number and location specified by your local fire code. Select and train employees in their location and use. Be careful to use the right type of fire extinguisher – some fires get worse if sprayed with water and often CO2 or foam extinguishers are safer. 7. Finally, maintain your fire suppression systems properly. Extinguishers and detection systems need to be tested regularly, as do sprinkler systems. 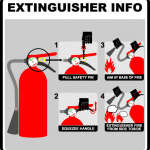 Extinguishers must be inspected once a month, recharged as needed and maintained every year. Alarm systems also need to be inspected and tested regularly. Fire Control Systems sells and maintains fire safety equipment including alarms, sprinkler systems and exit signage, and they will also inspect and maintain your fire control systems. Regular maintenance is important – you do not want one of your employees trying to deal with a fire with an empty extinguisher. Although you can do monthly inspections of manual extinguishers yourself, they must be maintained annually by a professional. Our trained staff can handle this and all of your fire control maintenance needs.